We’ve had some fun making these little succulent plant displays. 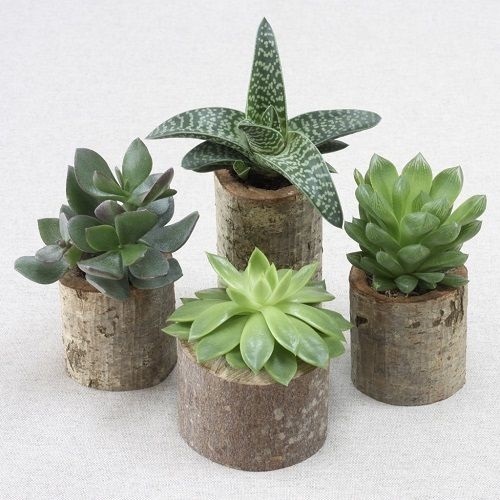 We hollowed out some small logs to make little pots for the plants to sit in. They are displayed on our Chatsworth Stone Teflon coated tablecloth, which with its natural colour and texture, will fit into so many interior design colour schemes. Did you know that prickly cacti plants are a type of succulent? These smooth leafed plants with strong distinct shapes will add real interest to your indoor spaces. Even better news, they are easy to look after! Succulents are great as indoor plants because they are capable of coping with dry conditions due to their fleshy leaves and thick stems which store up water. They thrive in bright light so during the winter months it’s best to put them near a south or east-facing window. Then for the spring and summer months you can move them outside to a protected spot out of the full sun. You can tell they need watering when the leaves start to shrink or pucker or the shiny leaves start to look a bit dull. They don’t like being overwatered and you need to let them drain so the roots don’t sit in water. Normal houseplant fertilizer is fine for most succulents and they only need feeding 3 or 4 times over the warmer spring and summer months – you can let them rest for the rest of the year. Styled and photographed by Lottie at Creative Reach on Chatsworth Stone Teflon Coated Tablecloth.